[The following is the cover story from Uptown, a local giveaway tabloid which is actually quite well done and entertaining. The cover itself is a bizarre flight of fancy -- its relevance to the story is obscure, at least to me. The scene seems to be set in hell, the background lit by orange and yellow flames. A taxi (Chev Caprice) is doing an Evel Knievel jump off a cliff through the ring of an enormous biological symbol for female (a circle with a cross underneath). In the foreground below the cliff, five silhouetted figures are waving spears tipped with the biological symbol for male (a circle with an arrow pointing northeast). The cover captions: "Are you talkin' to SHE?" 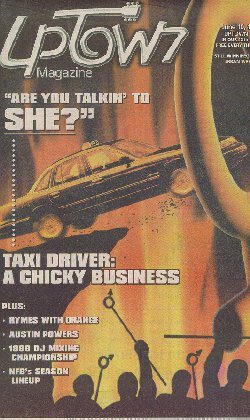 and "Taxi Driver: A Chicky Business." June 10, 1999, p. 8. Driving a taxi is one of the most dangerous professions around, especially if you're a night driver. It's the nature of the business: drivers work alone, carry cash, deal with customers in all kinds of altered states, and drive to remote areas. The International Labour Organization reports that out of all professions that require people to work alone, taxi drivers are the most at risk as far as violence is concerned. Often, customer intoxication plays a role in precipitating this violence. So why do women work as taxi drivers? Probably for the same reason as men do it: to make money on a job that promises every shift will be different. Irene Ducharme, a night driver for Duffy's Taxi, started driving five years ago when she grew bored with monotonous secretarial work and wanted a job with more flexibility. "Driving a taxi is very flexible. I can pick my own days and my own hours. I can be with my children during the day and drive a taxi at night." Terry Isaac also drives for Duffy's Taxi. She had worked the phones for 20 years and wanted to see the other side of the taxi industry. "As a telephone operator, you hear awful stories. I wanted to see for myself what the problem was with customer service. Well, it turns out the customers aren't bad at all." Ducharme and Isaac say they've had few problems with drunks and violent customers, but early in their careers, they both realized the kinds of danger cab drivers face. Ducharme says that during one instance, she picked [up] three men without taking the time to "read" them. As she drove the men to their hotel, they started touching her hair and her arm. "I told them to stop. They wouldn't stop. So I stopped the car and asked them to get out. Then they refused to get out. So I called for help and there were six taxis there right away. The police arrived right away too." Isaac also picked up a group of men she should've left on the street. "My first instinct said drive away, but I didn't." Once the men got in the car, she realized she made a mistake. She says the men were obnoxious, swearing at each other until their attention turned to her. One of the men asked her, "Have you ever been robbed before?" She replied, "I guess this will be my first time." She says she remained calm and didn't give the men the reaction they were looking for. One of the men finally said, "Don't worry about it, we're just trying to get to you." "Had I freaked out, I feel like they might've robbed me," Isaac explains. "The attitude of the cab driver makes a difference." Since these episodes, Ducharme and Isaac say they haven't had any serious problems with customers, but do have to contend with drunks who are often looking for more than a ride home. "They ask me, 'Can I have your number?' or 'Can you come up to my room with me?' I just say 'no'." Ducharme says the amorous men usually respect her response to their requests and points out that the problem of being hit on isn't unique to female drivers. "I know a lot of male drivers who have female customers trying to pick them up. It works both ways," Ducharme says. Both women agree that the key to staying out of trouble is knowing how to read a customer before accepting the trip. Isaac says she'll drive a customer who is tipsy, but if a person is throwing up or being carried out of a bar, she won't accept the fare. She says once you've accepted a fare, you have to treat all customers with respect. Ducharme agrees. "In this job you have to have a lot of patience." She says her university background in sociology and psychology helps her to understand customers. In fact, many customers end up telling her their problems. Isaac says the one thing she would tell a new female cab driver is never to get out of the taxi. "A year ago in May, one of our female drivers was severely beaten." The woman was waiting for three young men to come to the car. When she walked across the street to see what was taking them so long, they appeared and beat her severely. She no longer drives a taxi. Isaac offers another safety tip: if you've just picked up a creepy customer, let the dispatcher know the destination. "The person in the cab knows the dispatcher knows exactly where you're going." She says another way cab drivers tell the police and the public they're in trouble is to flash the top light on the cab. "If you see the light flashing, you know the driver is probably having a problem." Do women receive special treatment? Absolutely not, says Gord Barton, Marketing Manager at Unicity Taxi. "They're all tough as nails and they know how to handle people." Barton says Unicity Taxi has about 10 female drivers. Inderjit Claire, General Manager at Duffy's, says there are about 40 to 50 women driving for Duffy's. According to the International Labour Organization (ILO), a 1990 Australian study of taxicab drivers showed that the drivers ran 28 times the risk of non-sexual assault and almost 67 times the rate of robbery compared to the community at large. In Workplace Homicide: Industries and Occupations at High Risk, E. Lyon Jenkins, MA states that from 1990-1992 the taxicab service had the highest rate of work-related homicides at 41.4 per 100,000 in the U.S.
A 1998 ILO press release reports that taxicab drivers, health care workers, and teachers are at higher risk than others for experiencing violence on the job. Assault Avoidance Awareness, a video on taxi driver safety, can be borrowed from the WCB Films and Posters Section or obtained free of charge by calling the Justice Institute (1-604-528-5805). The video focuses on the four most common sources of conflict for drivers and how drivers can avoid dangerous situations.